The latest Mavericks beta carries the designation 13C44 and carries many of the same focus areas in the previous release. Apple is once again asking developers to concentrate on Mail, a built-in feature that has caused numerous problems since the operating system's release. 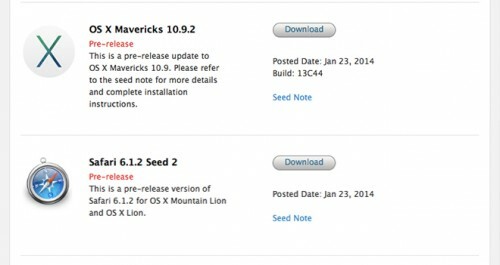 Apart from the new OS X beta, the company from Cupertino has seeded Safari 6.1.2 seed 2. Developers can grab the latest beta of OS X Mavericks 10.9.2 and Safari 6.1.2 seed 2 via Apple's developer center or Software Update.